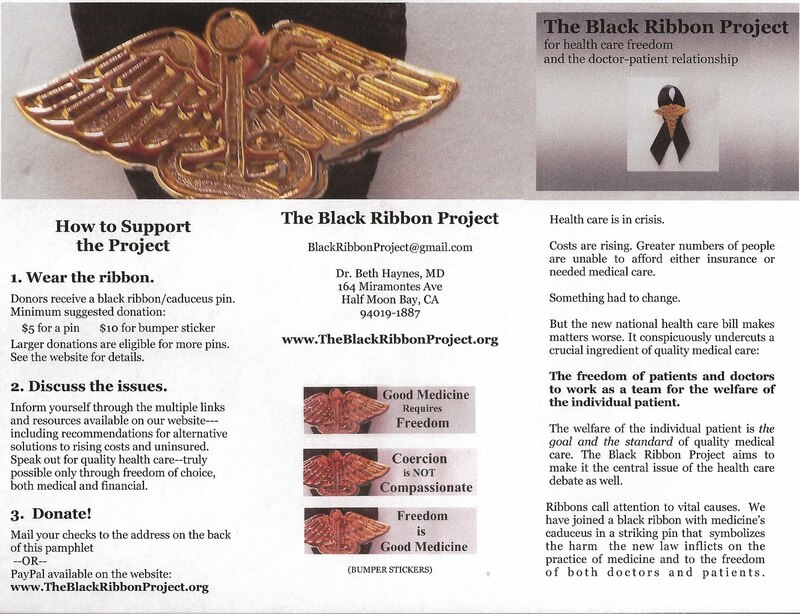 A lot has been happening with the Black Ribbon Project and an update of developments is long over due. Over 1000 ribbons have been distributed, with orders pending for several hundred more. Bumper stickers with 3 different slogans are now available to donors upon request. One BRP supporter was using a Post-It note to send a short message to her doctors. Included with every bill she paid was a note saying “Thank you. 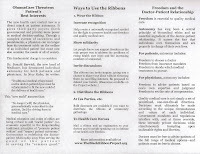 Health care is not a right.” To make the task easier, and to spread the word about the BRP, we designed the pre-printed pads shown below. The pads have 50 pages each and are also available to donors upon request. A new tri-fold pamphlet is almost complete. 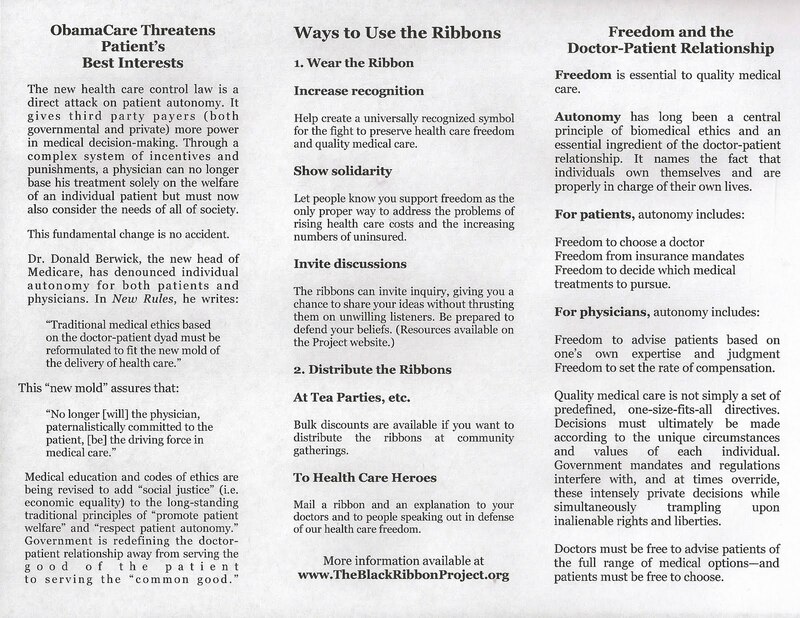 The pamphlet introduces the Project and offers suggestions on how the Black Ribbons can be used to focus attention on the fact that quality medical care requires freedom of choice. 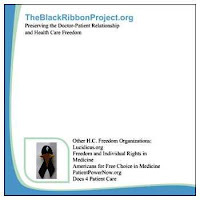 If you are interested in receiving pamphlets to hand out, email your request to BlackRibbonProject@gmail.com. 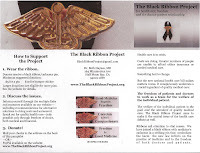 This month, I have had several opportunities to promote the Black Ribbon Project. At a fund raising diner for John Dennis (running for Congress against Nancy Pelosi) I met the leaders of several organizations who support the repeal of ObamaCare. Last week, I presented The Black Ribbon Project to the 67th annual meeting of the Association of Physicians and Surgeons. My talk was well received and I was able to distribute many ribbons and almost 20 bumper stickers. In addition, the board of AAPS voted to send a Black Ribbon and business card to each of their new members. This coming weekend, I'll be in Washington DC at a conference of the American College of Surgeons to help staff an informational booth for Docs4PatientCare --which will include pamphlets, pins and other materials from the BRP. ACS has officially announced its opposition to the new health care control law, so I'm expecting a warm reception. I'll also participate in a special physician's forum on the impact of the Accountable Care Act (a.k.a ObamaCare) organized by D4PC and the Heritage Foundation. I look forward to meeting the leadership of D4PC, who have been enthusiastic supporters of the BRP. Docs4PatientCare will also be sending a Black Ribbon to each new member of their organization. If you have suggestions for individuals you think deserve a letter of appreciation, please pass them along either in the comments or by email. It's a been a busy month---and I am looking forward to October being even busier!! If a doctor misdiagnoses the cause of a symptom, his treatment will not help and will likely make things worse. If a President misdiagnoses the cause of rising health care costs, his solutions will not help, and will likely make things worse. This is the situation we currently have with ObamaCare. The new health care control laws are constructed on the belief that the large numbers of uninsured along with profit-driven behaviors of hospitals, doctors and insurance companies are the cause of run-away spending and cost increases. For these reasons, the new law concentrates its efforts on mandating insurance coverage and increasing government control over the private medical decisions made between patient and physician. Attempting to increase access, the law lowers or eliminates a patient's out-of-pocket payments, increases mandated benefits by third parties (both governmental and private) while simultaneously reducing payments to doctors and hospitals. This analysis has it exactly wrong. The numbers of uninsured are the result not the cause of rising costs. Patients are insulated from the cost consequences of their medical care while doctors, hospitals and insurance companies are blocked from competing on price and quality. This hinders innovation and interrupts the normal market signals to increase supply and decrease cost. The REAL cause of spiraling health care costs is our current third-party payment system and the consequent economic separation of consumer from payer (and of effort from reward.) This disconnect is enhanced under ObamaCare. In "The Prognosis for National Health Insurance," Dr. Arthur Laffer (of Laffer Curve* fame) refers to this separation as "the health care wedge." Multiple segments of the new health control law aggravate this wedge: removal of co-pays, caps on the portion of premiums paid by the insured, government subsidies, price controls on provider payments, mandated benefits, and much more. On the consumer side of the market, the wedge diminishes consumers' incentives to monitor costs...On the supplier side, doctors and other medical providers receive no incentive to provide higher quality services for less cost. There is well documented evidence that individuals respond to lower cost-sharing by using more care, as well as more expensive care, when they do not face the full price of their decisions at the point of utilization. Americans have progressively been paying less and less of the costs of their personal medical care. In 1960, patients directly paid for almost 50% of their medical care. Today, out-of-pocket payments for patients in the private sector are only slightly more than 10% of the total cost for the medical care they receive. "Accelerated medical inflation, consequently, is strongly correlated with a growing separation (wedge) in the medical market between doctors and patients." What are the forces which cause this "wedge"? The primary forces are government actions themselves: rising government expenditures on health care, insurance mandates and regulations which favor third-party payment systems and "protect" patients from the financial consequences of their actions, cost-shifting due to medical welfare and entitlements programs, price controls integral to Medicare and Medicaid, to name just a few. But it is not just the cost of medical care which is affected. In the case of health care, the wedge also separates patients from doctors in determining what type of care should be provided. Decisions are made by government, insurers, and judges deciding medical malpractice liabilities.The government, lawyer, and third-party wedge in our current health care system causes [both] higher costs and diminished efficiency. Additionally, as health care costs rise and government increasingly foots the bill, the damaging effects spill over into the wider economy leading to slower economic growth, rising tax burdens, as well as lower wages and standards of living. The acceleration in health care costs needs to be brought under control. Because Obama has misdiagnosed the cause, the measures enacted in the new health care control law push us in exactly the wrong direction. ObamaCare increases the health care wedge, bolstering incentives to consume medical goods and services without the ability, let alone the requirement, to consider cost, efficiency or quality. 6. Reform tort liability laws. Although written before the final passage of the health control law, this article provides an excellent analysis of the economic and governmental forces which created our current situation and explains how Obama's policies will only make things worse. I encourage you to read the whole 24 page paper. *For a more humorous explanation of the Laffer Curve, you may enjoy watching this video clip by San Jose State University student, Gregory Downs, one of a series of ShortHand Politics clips he is producing to try and engage college students in economic ideas. **All quotes are taken from Laffer's article. A few months ago, I had dinner with a couple from Pennsylvania. Knowing the husband was a physician, I asked what type of medicine he practiced. He replied, "I am a dinosaur. Something that hardly exists anymore: a family practice doctor in solo practice." In addition to being a primary care physician in a small town, he is a small business owner, doing his best to survive in an era of increasing government demands both on his business and on his practice of medicine. Solo and small group practice is becoming less and less financially viable within the third-party payer system. In order to provide immunizations for children on Medicaid, he could not simply have a special shelf in his office refrigerator. Medicaid required he purchase an entirely separate refrigerator in which to store the shots. This was in addition to reams of paperwork accounting for the purchase and use of the immunizations for Medicaid recipients. Squeezed between falling payments and rising costs, the solo and small group practice of medicine is indeed endangered. More and more physicians are flocking to large group practices, frequently as employees. Maybe this is a good thing. But maybe not. However, patient demand is not the driver of this change, but rather the increasingly expensive government mandates placed upon the practice of medicine. Dr. Richard Reece, physician, author, and health care policy commentator, has a recent blog post on the effect of the ACA on physician employment. He summarizes the findings of a recent survey, "Physician Alignment in an Era of Change." • 74% [of hospital CEOs] plan to employ a greater percentage of physicians over the next 12 to 36 months. • More than 70% say they have received increases in requests [from] physician groups for employment. I spoke to John McDaniel, founder and CEO of Peak Performance Physicians, a practice management firm in New Orleans, and he pointed out to me that what’s driving hospital physician employment is not only anticipation of lower reimbursements under reform but the mounting costs and complexities of doing business. Complexity per se is not the problem doctors are currently facing. Medicine and business are replete with complex problems which must be faced and dealt with on a daily basis. The problem is that far too much of the complexities doctors must deal with are the constantly shifting mandates and regulations which substitute the plans and values of the politically powerful for the plans and values of patients working privately in conjunction with their doctors. Will the system of employee-physicians that is emerging be superior to the independent private practice of medicine? It depends on your criteria for judging. If the goal is to meet the individual medical needs of patients according to their personal priorities, offered on a voluntary basis by physicians whose primary focus is the welfare of the patients he treats, then the ACA pushes us in exactly the wrong direction. Physician autonomy is a major defense against those who comfortably sit in remote offices and make calculations based ont concerns other than an individual patient's welfare. Uniformity of practice is a nonsensical goal that fails to allow for differing expression of disease states. this is not to say that critical research, randomized controlled trials, literature meta-analysis an guidelines are not necessary and useful. They are all essential...But we must recognize that many physicians will often make decisions that deliberately do not conform to "community standards"---and that patients will be better for it. Dr. Greenfield correctly points out that quality medical care consists of physicians applying their independent assessments to the unique circumstances of each individual patient. Without autonomy, this goal can not be achieved. Read the rest of what he writes "In Defense of Physician Autonomy." The new healthcare law has multiple provisions which disrupt individualized decision-making between the physician and patient. This is no accident. It is by concerted design. The health care system will evolve into 1 of 2 forms: organized around hospitals or organized around physician groups...Only hospitals or health plans can afford to make the necessary investments in technology and management skills." "I can not believe that the individual health care consumer can enforce through choice the proper configurations of a system as massive and complex as health care. That is for the leaders to do." "I would place commitment to excellence--standardization to the best-known method--above clinician autonomy as a rule for care." These health care policy makers believe the source of our health care problems stem from the autonomous decisions made by the private doctor-patient team, working together in the best interest of the individual patient. They have forgotten that the best interest of the individual patient is the purpose and standard of medicine--both morally and practically. The health of the nation depends on the sum of the health care provided to individuals. Nothing more or less. Medicine for the masses is meaningless if the lives and health of individuals are sacrificed to the "common good." Physician fiduciary duty-a thing of the past? What is the fate of the doctor-patient relationship in a Donald Berwick designed health care system? The more the government controls health care delivery, the more it will have to control medical decisions themselves, which means less control for is left to individual doctors and patients. Proponents of the ACA continue to claim that it is NOT "socialized medicine." The desire to distance the law from this term is because it is well known that socialized medicine does notimprove quality and access and does reduce individual freedom. Tthe essence of socialized medicine is centralized government control for the purpose of creating material equality by taking from some to provide for others--and that is exactly what the new law is designed to do. Let's call it "socialized medicine"---because that's exactly what it is. HT John Goodman's Health Policy Blog.